The Best Shade Canopy and Sail Provider in all of Phoenix Arizona! Phoenix Arizona's number one source of shade structures and shade sails in Arizona Shade Sails. We service the entire Phoenix Arizona area. Let's be honest - It gets really hot in the summer time in Phoenix Arizona. With the heat comes the desire for shaded areas and figuring out a way to keep cool! Well that search to keep cool and enjoy your summer is here! 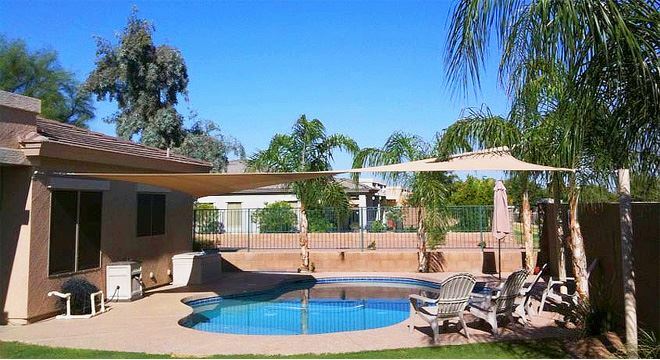 We offer the longest lasting and most durable shade structures in all of Phoenix Arizona! If you have a Pool that needs some shade so you can actually enjoy swimming without burning yourself or having to constantly re-apply sunscreen, then this is the solution to your problems! Nothing brings more of a resort style feel your home or business pool areas than shade sails! They are elegant, provide maximum shade and offer only the best durability and tension. They hands down are the best shade product that can cool your pool areas - keeping you, children and your guests cool and enjoying the pool areas all summer long! Do you have a Patio space that needs some serious shade and temperatures reduced? Perfect - we are the solution to your hot patio problems! Shade Sails provide the most elegant and beautiful patio spaces and most importantly dramatically keep your patio cool! We offer only the highest quality shade sail fabric in all of Arizona, specializing in the Phoenix area! Our fabric is heavy duty and can take on the heat the Arizona sun brings in. It is weather proof, rain proof and UV proof. They are truly the perfect solution for a proper patio cover in Arizona! So what are you waiting for? If you have a patio space that needs to keep cool, give us a call today or request a free online estimate! Are you looking for that perfect canopy shade for your pool, patio or business? We can help. We are one of the few companies that offers fully customizable shade canopies and covers. When we come out to assess your home or business we will give you ideas and our recommendations. We will then have our experts get to work at designing in our CAD program a concept drawing of what the completed shade sail project will look like. Nothing is better for homes or business than shade canopies to provide the comfort you need to keep cool in the extreme Phoenix Arizona heat! We are ready to get to work for you at planning your patio cover and business shade projects. Please give us a call or request a free online estimate today! 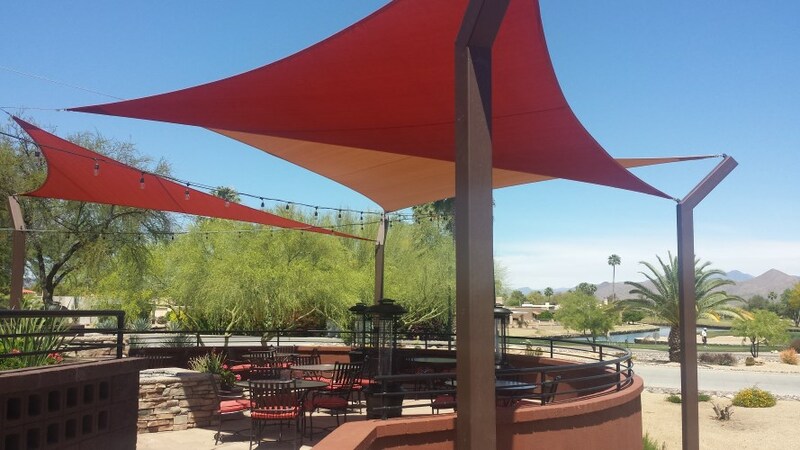 Do you own or manage a business in the Phoenix or surrounding areas that needs shade? Are you trying to keep customer or employees cool? Are you trying to figure out how to protect expensive equipemnt from getting damaged from the UV rays of the sun? Your search ends now! We provide the absolute best solutions for shade covers in Arizona! Our commercial shade sails and posts are extremely heavy duty, built to last, and do the job of protecting anyone or thing from the heat. We offer completely custom shade sails, styles and colors for every individual project demand. We cover the largest shade sails jobs you can bring at us. So, whatever you had in mind, give us a call and let us know or submit a estimate request online! We would love to hear from you! Let's get your hot areas shaded! If there is one thing we know how to do well, its awnings and shade structures. We supply the best awning solutions for any home type or business. 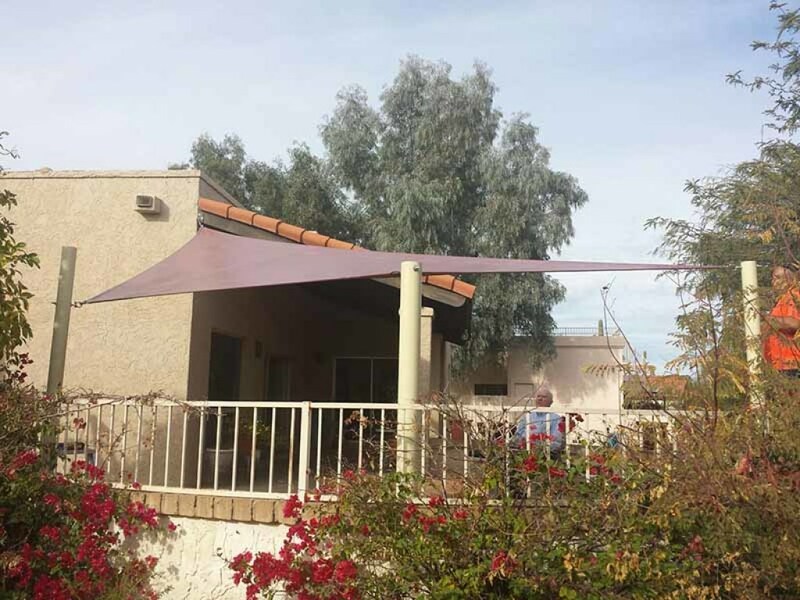 Awning shade in Phoenix offers a beautiful look and most importantly serves a purpose in blocking the light and heat from the sun. Awnings in Phoenix are the perfect solution to keep your customers or employees protected from the Arizona sun. They also provide a great look on the exterior of your home and business turning maybe a ordinary place into not so ordinary! When your looking for any kind of shade structure awning, we offer the complete solution. From the estimate quote, to design and production and then installation. We have you covered from start to finish! Give us a call or request a free shade estimate online!